Recipe yields 12 regular sized muffins. Preheat your oven to 350 degrees and spray a muffin pan with non-stick baking spray or fill with paper muffin or cupcake baking cups. Set aside. Using a large sized mixing bowl, mix together the whole wheat pastry flour, flaxseed meal, flaxseeds, old fashioned rolled oats, shredded coconut, brown sugar, baking soda, baking powder, salt and cinnamon. Add in the eggs, applesauce, yogurt and vanilla and mix until just combined. Do not over mix. Add in the almonds and dried cranberries and mix one more time. Fill each muffin cup about 3/4 full. 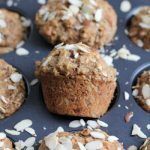 Sprinkle on almonds over each muffin and bake for 20 to 25 minutes, or until golden brown and a tester inserted comes out clean. Let the muffins cool in the muffin pan for at least 20 to 30 minutes before removing (if you did not use paper liners).